We treat each individual flag order as a special order. We pack each flag as needed to arrive in great condition. Once we have your ‘Ship To’ address we will calculate a shipping/handling cost to be added to the price of your selected flag. All framed flags will be shipped via FedEx Ground or by USPS PRIORITY whichever one has the best service and lowest charges to your delivery address. Shipping charges include insurance and special carton and packing charges required to get your flag delivered on time and undamaged. 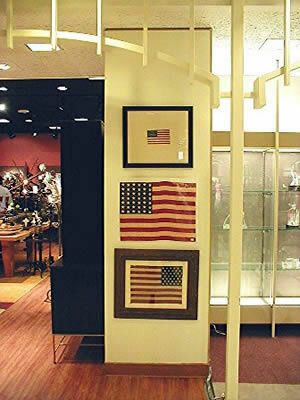 Large or oversized flags/cartons may require the use of shipping companies that deal with unique oversized items. Individual shipping charges will be calculated on an individual basis. Once we do the above we will contact you to give you the final total. We accept MasterCard, Visa, Discover & American Express. Your sales total can also be paid by PayPal, Check, or Money Order and we will contact you via email or phone. Notice – Unfortunately we do not ship to Canada, due to excessive & prohibitive freight cost and considerable & un-acceptable time consuming paperwork, rules & regulations to be filed for each shipment.